Magnetic Resonance Imaging (MRI) of the pituitary gland has undergone enormous development since the initial reports (early 1980s) and has some advantages over Computed Tomographic (CT) scanning (including greater soft tissue contrast and absence of bone artifact). Reportedly, over 75% of pituitary tumors are hormone secreting and the most common hormone secreting pituitary tumor secretes prolactin (hormone). 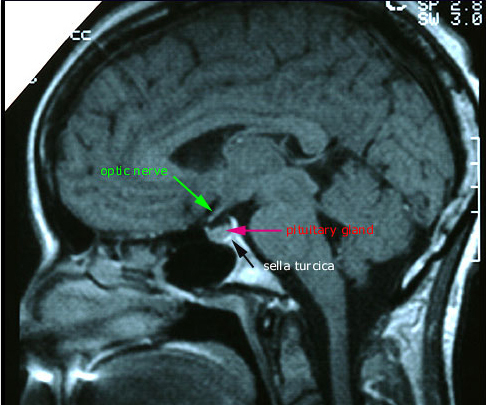 This radiograph (of an MRI) demonstrates a normal (sagittal section of the) pituitary gland (red arrow) within the (bony) sella turcica (black arrow) that is inferior (but close) to (under) the optic nerve (green arrow). This normal saggital view can be compared to the abnormal radiographs of pituitary tumors (to follow).